Ben Ngubane was born in Natal in 1941. Most of his schooling took place at the Mariannhill Mission where he matriculated in 1960. He graduated MB ChB in 1971 from the Medical School of the University of Natal, Durban. He came from a family involved in traditional politics, but first made contact with broader political issues while at medical school where he was involved in student politics. He served as vice-president of the National Union of South African Students, and worked with Steve Biko during the time Biko was active in NUSAS. Ngubane joined Inkatha in 1976, and in 1978 was elected to represent the Enseleni district in the KwaZulu legislative assembly. Ngubane served as a member of the Red Cross Natal Region from 1977, as a delegate of the South African Red Cross Society at international congresses of the Red Cross, as a member of the Council of the University of Zululand and as a member of the Natal Boxing Board of Control. 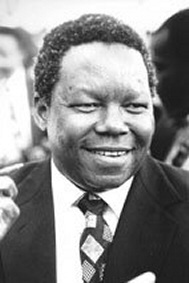 In 1991 Ngubane was appointed Minister of Health in the KwaZulu government, a post he held until 1994. In 1992 Ngubane served on the CODESA working group which dealt with constitutional principles and constitution making. In 1993 he was involved in negotiations with the ANC on behalf of the IFP. Ngubane headed the IFP's KwaZulu Natal regional list to the National Assembly and following the elections was appointed as Minister of Arts, Culture, Science and Technology in the government of national unity. He also served a as Premier of KwaZulu Natal for a short time. However, in 1999 he was reappointed to the ministry and in 2002 was elected Chairperson of the Commonwealth Science Council. In 2004 he was appointed Ambassador to Japan. Source: Shelagh Gastrow, 1995. Who's who in South African Politics, Number 5. Johannesburg: Ravan Press.